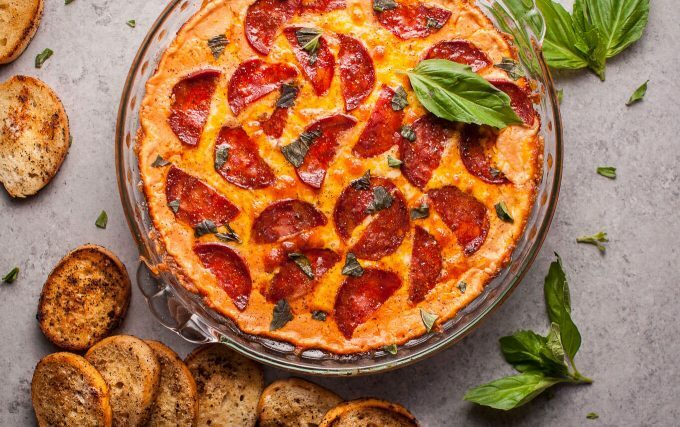 I love chorizo, and I’m also constantly craving pizza, so I figured it was time to put two of my loves together into one amazing dip. With football (go Broncos!) and NHL hockey (go Oilers!) starting up shortly, now’s a good time for me to put up some good game-day/tailgating party type food up here. This dip is quick to prep, and the hardest part is waiting the half hour until you can devour this ooey gooey cheesy dip hot out of the oven! You could bake this in pretty much any oven-safe shallow dish. I used a 9.5″ glass pie dish – I’ve seen other pizza dips made in these, and most people have them or something similar. Love chorizo? Try my easy chorizo pasta. 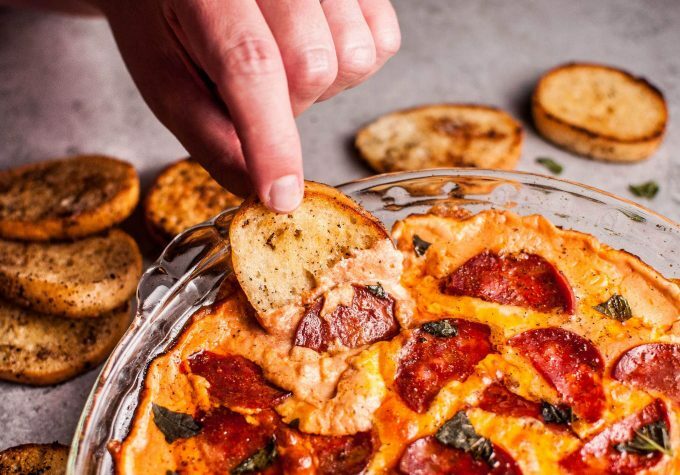 Questions about this sausage pizza dip? Let me know! 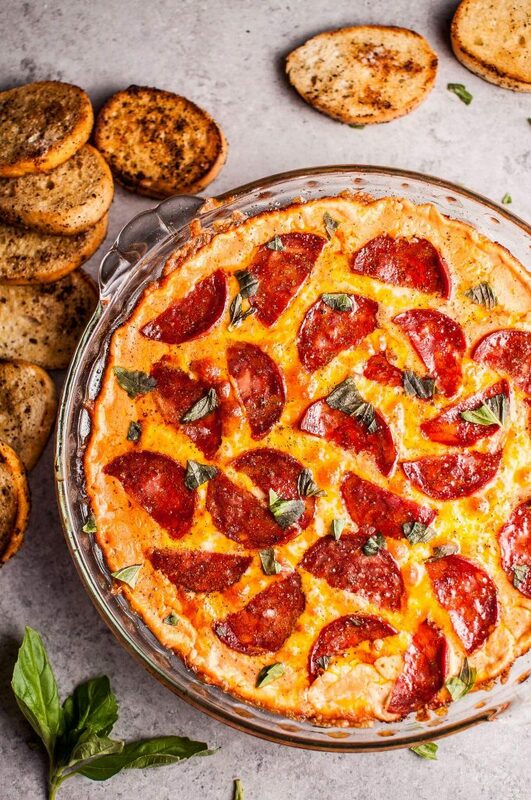 Chorizo pizza dip with garlic baguette slices for dipping... because all that cheese, garlic, and flavor just go so well together. This hot dip is easy to make and will please a hungry crowd. Take the cream cheese out of the fridge to allow it to soften. Preheat oven to 375F. Move rack to the top third of the oven. Grate the cheeses (if not buying pre-grated) and cut the chorizo into bite-size pieces. Mix together the cream cheese, half the parmesan, the garlic powder, onion powder, dried oregano, sour cream, and salt & pepper. Spread it evenly along the bottom of a baking dish (I used a glass pie dish). Add the tomato sauce and spread it over the cream cheese mixture. Add the basil leaves (tear them into smaller pieces) then the rest of the parmesan, the cheddar/mozza cheese, and finish off with the chorizo on top. Meanwhile, if you want to make the garlic baguette toasts, slice the baguette into fairly thin slices. Add butter to a skillet on medium-high heat and fry each slice. When they're nearly done, lightly sprinkle them with garlic powder. If the pan starts to smoke, I suggest turning the heat down. Alternatively, you could just use a toaster to toast the baguette slices and then add butter and garlic powder after. I used a Pyrex 9.5 inch glass pie dish like this one. Chorizo is fairly salty, so you can get away without adding extra salt. This dip can be re-warmed in the oven the next day, but it is best fresh. Thanks! I think it would too haha. Hope so anyway ???? Oh my! That looks sooo tempting! This is something my teen daughter would absolutely love. Thank you! Let me know if she likes it. ???? Oh my gosh, that looks to die for!